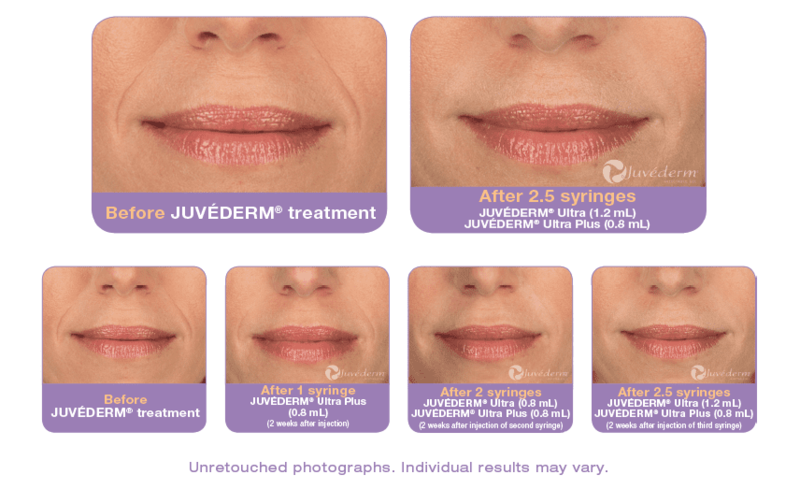 Juvederm® is an injectable gel filler made of hylauronic acid, a naturally occurring complex in the body. Aging, combined with sun and other environmental damage, can cause the natural hyaluronic acid to become depleted. This results in sunken skin and facial wrinkles, like those around the nose and mouth (often called parentheses or marionette lines). Juvederm® can help replace lost hylauronic acid and make the skin appear suppler and smoother. Juvederm was approved by the FDA in 2006 and its the only hydraulic acid filler that lasts up to 1 year with 1 treatment. With long-lasting JUVÉDERM® XC, you can treat those parentheses lines on the sides of your nose and mouth for up to 1 year with 1 treatment. No other hyaluronic acid (HA) filler can say that. One of the benefits of Juvederm® is that it is infused with lidocaine, which decreases the amount of discomfort during and after the injection. Juvederm® is also known for being smoother than other fillers, such as collagen, and can last up to 9 months.